K9 Immunity Plus is the new and improved all natural canine immune system support supplement from Aloha Medicinals. We first learned about K9 Immunity upon discovering Jerry’s osteosarcoma lung metastasis. That’s when we started giving him the seven K9 Immunity pills plus one K9 Transfer Factor wafer, daily. Now with the new K9 Immunity Plus, dogs with cancer can benefit from this powerful immune system supplement regimen, and get a good dose of the high quality fish oil K9 Omega, all in one tasty treat! Check out these K9 Immunity FAQs for more information. K9 Immunity Plus is a double-strength soft-chew version of K9 Immunity that combines all the active ingredients of K9 Immunity and K9 Transfer Factor with high-potency omega 3 fatty acids from K9 Omega fish oil. This treat-like wafer is packaged in resealable Mylar bags that come in three sizes – for small dogs under 30 pounds, mid-sized dogs 31-70 pounds and for large dogs over 70 pounds. Each bag includes a one-month supply for maintenance dosing or dogs in remission, and two bags make up a full month’s treatment for newly diagnosed dogs in an active disease state. The K9 Immunity component is a pure immune active polysaccharide mixture, formulated from specially concentrated and purified heteropolysaccharides derived from six species of laboratory cultivated medicinal mushrooms. 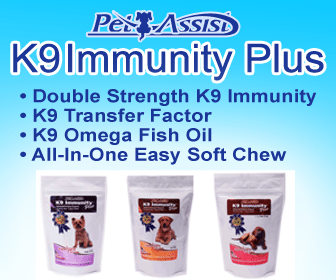 Why Choose K9 Immunity Plus? K9 Immunity Plus is an all-natural, non-toxic daily supplement made only from 100% USDA Certified Organic materials. It is made entirely in the USA with all American ingredients. Cancer is a serious disease and there are no magic bullets or certain cures. K-9 Immunity Plus, however, is a valuable tool that can be used as part of your chosen canine cancer treatment regimen to achieve the best possible outcome for your dog. Any cancer treatment protocol should be overseen by a veterinarian or veterinary oncologist. Please share all the information here with your vet staff and encourage them to contact Aloha with any questions they may have. Please review Aloha’s “For the Veterinarian” information and print it out for your vet, as this gives the technical information they may require to gain the full potential from these products for your dog. How Does K9 Immunity Plus Work? K-9 Immunity Plus is an immune system modulator used for dogs fighting serious illnesses including cancer. It is made from the same pharmaceutical grade immuno-modulating compounds as the human grade Immune-Assist Critical Care Formula from Aloha Medicinals. It is formulated, however, especially for dogs with cancer. Developed from DogCancer.net human cancer research, K9 Immunity Plus was first used in treating cancer in guide dogs for the blind. It is now available as an over the counter supplement for your dog. addressing the underlying cause, which is a failure of the body to recognize the cancer cells as invaders and destroy them. This failure of the recognition response is what allows the cancer to grow, and is an immune system dysfunction. What Aloha attempts to achieve with K9 Immunity Plus is to trigger the dog’s immune recognition response. For more information, and to determine if K9 Immunity Plus is right for your dog, please find complete details at the Aloha Medicinals website. Check the following Tripawds News blog and discussion forum links for additional feedback. Artemisinin or K9 Immunity: Are You Taking Them? Love this product! I use this on Maggie. So nice to have all three supplements in one AND not have to give an enormous amount! Do you or would you help someone who can not afford your product to prolong the life of their companion? Tripawds does not make K9 Immunity Jeannette. You will need to contact the distributor or manufacturer directly. You might also consider the various veterinary financial assistance resources we list for just this reason. Best wishes!